Real Name and Ethnicity – Who is AnneMunition? AnneMunition has kept her private life, including her real name, super private. She believes it’s no one’s business and unimportant as it doesn’t improve the viewing experience of her followers. What we have been able to put together shows that she was born on the 12th of May 1990, in southern California. She has two siblings (a brother and a sister) and they were raised by their mom. AnneMunition is multiracial but she shies away from discussing the major ethnicities that make up her multiracial identity. She once said that she does not like attaching herself to a specific ethnic group so as to not give people talking points. Another reason for her silence is that she doesn’t want to alienate herself from anybody just because they are from different ethnic groups. She believes in people hanging out together and playing video games irrespective of religion, gender, ethnicity, and sexuality. AnneMunition is a college graduate, she studied a four-year graphic design course. We learned that she started gaming at a very young age, thanks to her mom who bought her and her siblings a Super Nintendo gaming console when she was just 7. She and her siblings immediately got hooked to games like Super Mario World and spent all their free time playing it. From these classic games, they progressed to online console games such as Halo: Combat Evolved, Halo 2, and Halo 3 which they played on Xbox Live. Gaming took a back seat for AnneMunition when she entered college. She spent her time studying and working. As such, she had little or no time for gaming. After she graduated from college, she joined the proverbial rat race, working a desk job as a graphic designer. Even though the job paid well, it was too easy and did not challenge her productivity. She found herself with free time once again and spent it surfing the internet. It was while doing this that she stumbled upon a twitch stream. She found it interesting and started watching them regularly. From watching, she started sharing her own videos on the platform on the 3rd of June, 2014. Her channel proved to be a big hit and two months later, she became a Twitch partner. Following her resounding success, AnneMunition quit her regular job to focus wholly on streaming. This decision has proved to be a good one as she has gotten opportunities she would never have dreamt of. 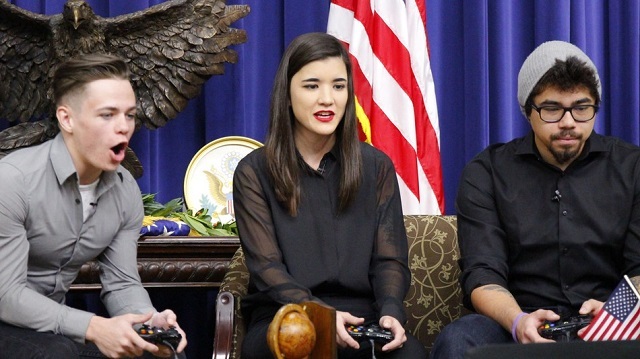 She is regularly invited to gaming conventions and has even been to the White House to take part in eSports and gaming marathons. She also has sponsorship deals with companies like Intel and Corsair. However, it has not been all smooth sailing for the California native. She sometimes encounters vile insults from fellow gamers and the insults are often sexist in nature. She recently posted a video of such incident on Twitter and it triggered a discussion about the toxic nature of online gaming. The video spread like wildfire and one of her tormentors was forced to apologize for his behavior. When it comes to sexual orientation, AnneMunition describes herself as predominantly homosexual, and incidentally heterosexual. This means that she mostly dates women but can occasionally be interested in dating a guy. At the moment, she has a girlfriend even though her identity is not known to the public. The only reference she has made to her is a twitter post made on the 3rd of August, 2017; in which she informed her followers that she thoroughly cleaned her house in preparation for her girlfriend’s visit. AnneMunition is outspoken about LGBT issues, especially as it affects streamers in the gaming world. She is regularly invited as a panelist on LGBT issues at TwitchCon, an annual gaming convention organized by Twitch.